Cisco Systems to react immediately when it learned Research In Motion (RIM) launched the Playbook on Thursday night. 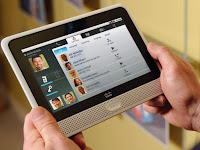 The company said the Cisco Cius tablets made by Cisco been ordered and already delivered to customers. Cisco said in a blog post last week that representatives and direct sales through their partners since 31 March. Later at the end of May, customers are certain to receive the tablets Cius. "Cius Tablet will have a 7-inch screen, so that smaller and lighter than the iPad. While IPAD does not have a camera, then Cius will have two. Features video conferencing will be the main focus of this product," said Barry O'Sullivan, senior vice president of Cisco's Voice Technology Group. However, Cisco aims to make Cius as 'IT-friendly', providing information to the department of technology to provide extensive control over what applications are installed on the device. The tablet will come with the ability to deal with Wi-Fi and broadband networks. Cius can use an external monitor and mouse or wireless keyboard, which can even be used as a substitute for a desk computer by connecting to a server running a virtual application. "Cius will be priced at less than $1,000," he added.